Vintage DuBarry sewing pattern 2682B. Coat or jacket has center back seam forming pleat at lower edge. Patch pockets are lined and have flaps. 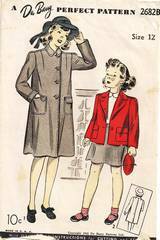 Jacket and coat may be lined or unlined. Girls Size 12; Breast 30; Waist 26.5. Used and complete. Unprinted pattern pieces.